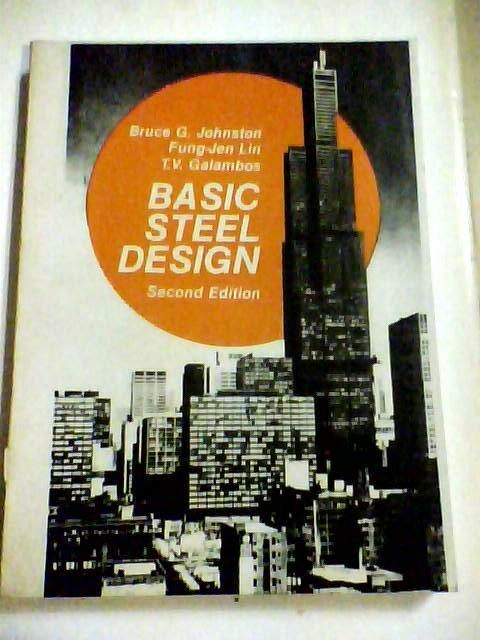 This book is concerned with the basics of structural steel design. It is suitable for reference use or as a text and is unique in at least two respects: (1) reference is made primarily to a single design specification—that of the American Institute of Steel Construction, and (2) the chapters on individual member design include flow diagrams, similar to those used to guide the development of a computer program. These diagrams have been found to be excellent teaching aids. The use of complex theory is minimized. The purpose of design is to produce a Structure. In the design of monumental structures, elaborate analyses, in many cases involving use of the computer, may be required. But in the initial study of steel design, the acquisition of a basic understanding of structural behavior and the meaning of specification requirements can best be attained by simplicity of approach and emphasis on the development of sound structural judgment. Chapter 1 is a broad and descriptive introduction to the steel structure, covering the properties of steel, the history of the development of steel structures, and touching on the topics of economy, safety, planning, fabrication, construction, and maintenance. Chapters 2 through 7 are devoted to the various types of structural members in common use: the tension member, the beam, the column, and so on. Each of these chapters takes up the structural behavior problem, explains pertinent AISC Specification clauses, and summarizes (with the exception of Chapter 6) the logical application of the specification by means of flow diagrams. Although the flow diagram was developed primarily as an aid to the development of a computer program, it also serves admirably as a summary and as a guide to the logical sequence of steps that must be taken in the design selection, of a particular structural member. Chapter 8 goes beyond the treatment of the individual member to provide a study of both the elastic and plastic design of continuous beams and frames. It provides a review and summary of the moment-distribution method as applied to the design of such structures. Chapter 9, on load and resistance factor design, like Chapter 8, is entirely new. It represents a probable future trend that introduces probabilistic and statistical procedures to achieve a better and more rational balance between economy and safety in design. This material was prepared by T. V. Galambos, director of research on this subject as sponsored at Washington University by the American Iron and Steel Institute. Chapter 10 covers special topics that are of occasional importance, but less common than those treated in the earlier chapters. These topics include the torsion of both open and box members, combined bending and torsion, biaxial bending, lateral-torsional buckling, and the shear center. A final new addition, Chapter 11, briefly summarizes various aspects of computer-aided design. Steel design specifications are essentially similar, but the diversity of formulas pertaining to identical problems (such as the column design formulas) is confusing to the beginning student. But after learning to design with a particular specification the student can readily adapt his basic knowledge to a different one. The purchase of the Steel Construction Manual of the American Institute of Steel Construction is essential to the complete use and understanding of this book. The AISC Manual also includes the AISC Specification, which will be referred to throughout the book. Moreover, practice in use of the AISC Manual is essential as a secondary educational objective toward structural design practice. The nomenclature that will be used herein is nearly identical with that found in the AISC Specification and will not be repeated herein, except in individual references to the presentation of equations or formulas. A flow chart location where a specification criterion is either met, or not met, and the answer determines which of two alternative paths must be followed in making an exit from that particular location. requirement or statementA flow chart location where an opening or closing statement is made, or where an operation, as stated, is to be performed. Represents a junction in the line of flow. An alphabetic character in the circle identifies a unique location to transfer to within a flow chart. Entry to or exit from a page A numeral in the offpage connector symbol shows the matching locations of entries and exits. Special acknowledgement is made to William Milek, Jr., of the American Institute of Steel Construction, for his cooperation in the preparation of this book, and to Frank W. Stockwell, Jr., also of AISC, for his detailed check of much of the final draft of the first edition. Thanks are also due to Randolph F. Thomas for his help in the preparation of many of the drawings. The first author has appreciated the support of his wife, Ruth, and will always be indebted to his father, the late Sterling Johnston, for having inculcated from an early age an empathy with steel structures. The second author has always appreciated the support of his parents, Huan-Yu and Chang, and the University of Michigan, where he completed his doctoral studies. The Prentice-Hall staff, through Christopher Moffa and Lori Ogre, have been most cooperative in expediting the processing of the manuscript. Acknowledgment is also due to Sterling Johnston, in charge of computer services for structural analysis and -design at TVA, for his review and suggested revisions of Chapter 11. Each chapter includes a number of example problems which are presented with more complete details than would be required by an experienced designer. Problems for assignment are also included, with initial emphasis on variations of the example problems, thus adding incentive to the careful study of the examples in the text. A word about Sl units and the trend toward their adoption. It would be counter to the essential purpose of this book in its 1: 1 relationship with the AISC Specification and Manual not to use the same units. All specification formulas and tables would need to be rewritten and the result would be confusing to the reader. In any future edition of this book we will, of course, adopt the same units as are then used by the related specification and manual.